Summer is in the air! And that means warm weather, BBQs by the poolside, and family vacations. I remember growing up my family always looked forward to summertime for this reason in particular. Now that I’m older, I enjoy local adventures and exploring new things. A few years ago, I discovered the beautiful shores of Lake Taneycomo on the Fall Creek Lakeside Wilderness Trail located right off of Highway 76 in Branson, Missouri. 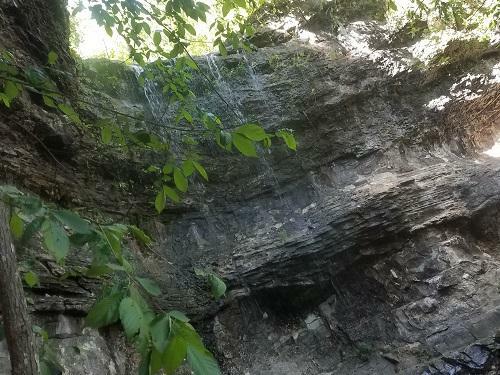 Lakeside Forest Wilderness Area is located in the heart of Branson and offers a nature oasis with 140 acres of beautiful wooded trails. There are all levels of trail difficulty in the trails, from beginner to expert. My favorite trail includes over 300 man-made stepping stones that will lead to a grotto, a few small caves, and even a waterfall! The Fall Creek Lakeside Wilderness is not only beautiful; it’s also a hotspot in history. Some of the caves you will see along the paths were Civil War hideouts. The property also includes the Lyle Owen homestead, originally built in 1911. Lyle Owen purchased the property in 1934 and began adding stone features, including 360 feet of mortared wall flower beds and over 200 feet of stone wall for retaining purposes. Owen also used the native fieldstones to build the 315 steps leading down the bluff to Lake Taneycomo. There are picnic tables and porch swings near the old Owen Homestead. I would suggest taking a break here for a relaxing picnic with your friends and family. The Lakeside Trail is a great oasis of peace and nature in the middle of Branson. This past weekend the Branson Recreation Team adventured out into the Ozarks to find this oasis of wildlife and history. Alex, Mollie, and I teamed up to take on the trails. It was Alex and Mollie’s first time on the Lakeside Trail, so it was exciting to show them the ropes. There’s nothing like a difficult trail to make a group bond as a team! 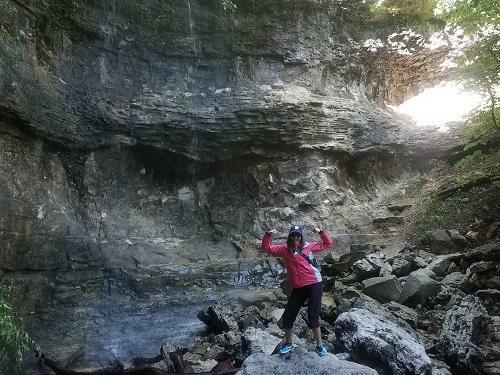 Next time you stay with Spinnaker Resorts in Branson, make sure to plan a day trip out to the Ozarks and hike every trail you have the chance to. Best of all, it is only 3.5 miles from Palace View and Palace View Heights Resort, and 3.2 miles from French Quarter Resort. 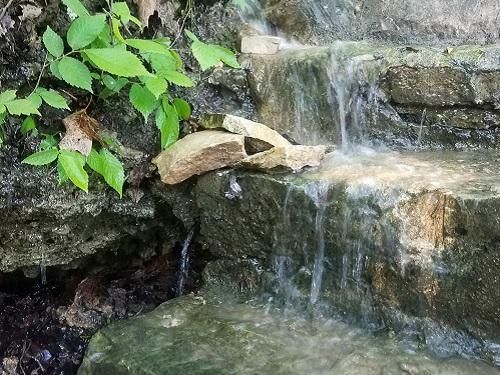 Ask your Recreation team about this beautiful trail and many other local things to do during your stay here in Branson! Recreation team member Mollie striking a pose under the waterfall! Have you hiked this trail before? Share your thoughts with us on Social Media! Are You Ready for Summer with the Branson Activities Staff?